Let’s talk about the best burger you ever stuffed your face with. I still to this day am still looking for the best burger. Sometimes, an In-n-Out Double Double will do — Animal Style, with grilled onions, raw onions, and secret sauce. As good as that is, it doesn’t scream out gourmet. And every good burger needs the perfect batch of french fries on the side, and In-n-Out is far from it. 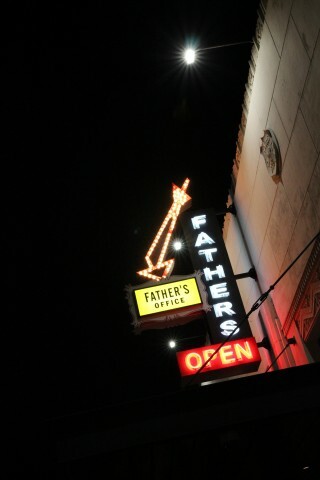 The Office Burger at Father’s Office is acclaimed by many to be the best burger in Los Angeles. I know that may be a shock to diehard In-n-Out fans, but Sang Yoon’s Office Burger is quite delicious. 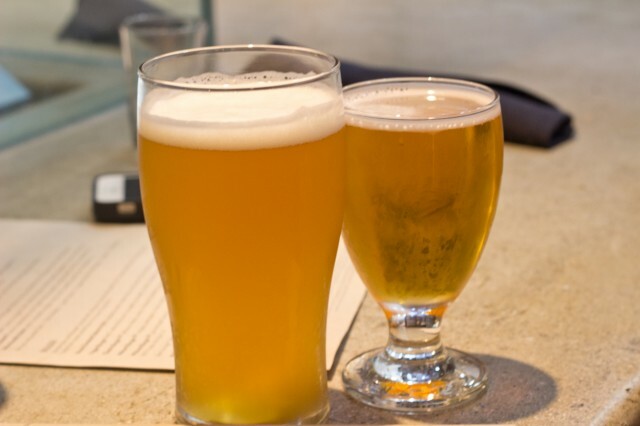 The gastropub offers some of amazing beer selections and pairs well with the menu. 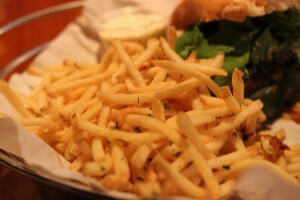 For this blog post, it will only concentrate on the burger and fries. The Office Burger received a lot of criticism because some say it’s not a burger, but a sandwich. 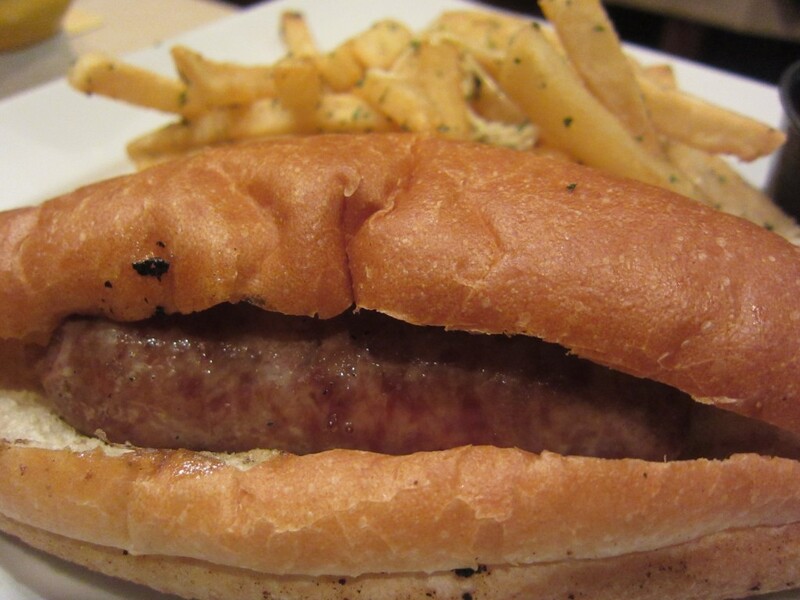 Instead of a traditional bun, they use a French roll of a sort. My question to you is, what makes the sandwich, the patty or the bun? For no reason whatsoever, let’s just call this a burger. Come on.. it’s a burger. The melted gruyere and Maytag blue cheese ain’t enough of a reason to call this a burger? How about the dry aged beef patty? What sandwich has grilled onion bacon compote? Honestly, the reason I like the Office Burger is because of this onion bacon compote. The sweetness of the onions and savory bacon create such a perfectly “umamic” flavor profile. (I don’t know if umamic is a word, but I will try and see if it’ll fly.) This went perfectly contrasting to the arugula in the burger. Everything together with the patty, cheese and compote perform a perfect symphony on your taste buds. As I mentioned, a good burger needs an equally good side of fries. Father’s Office fries are quite delicious. Maybe it’s because I like shoe string fries, and I like my fries crispy. 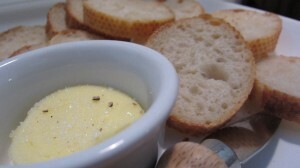 Dipping it in their tangy aioli puts all other sauces to shame. I see why they still to this day don’t have ketchup at the restaurant. Crispy and firm, the fries are something to reckon with. I’ve had a few Office Burgers in my eating career, but never really blogged about it. The question remains though, is The Office Burger the best burger in Los Angeles. It possibly is, but tastes vary between people and time. I was surprised to find the waiter ask me how I wanted my burger cooked though. I guess forcing people to eat burgers medium rare like back in the day doesn’t fly anymore. 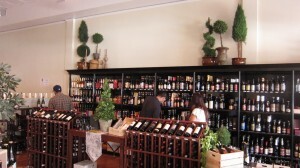 The Helm’s location is second to the original Santa Monica location. 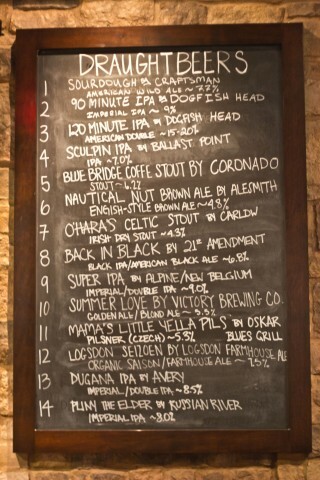 Still though, the gastropub offers amazing beer and a burger to compete with anything around. Echo Park is getting there. In the past years, the sub city has been making strides to beautify and clean up the mess. Echo Park in the 80’s and 90’s was terrifying. 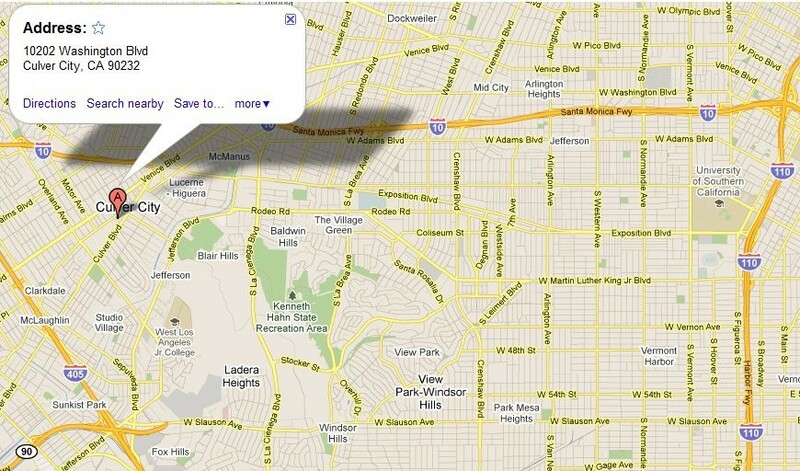 As a child, I remember visiting my grandparents who lived in Echo Park. Those were some rough memories, but still fun. Today, the remnants of that era still linger, but in a beautiful way. Boutique shops and restaurants popped up all over Echo Park — on Sunset, west of Alvarado at least. 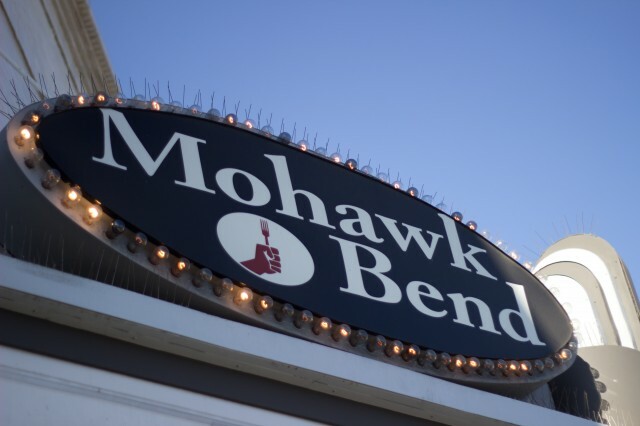 One such restaurant, Mohawk Bend is one of many that turned something ugly into something amazing. Owner Tony Yanow turned the 100-year old Vaudeville Theater into what Mohawk Bend is today. For awesome pictures and to learn more about the architecture, check out Freshome. 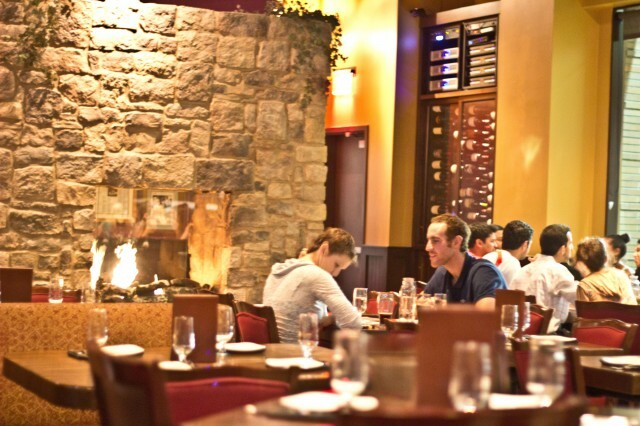 Mohawk Bend is a restaurant and bar that sources everything locally. They appeal to meat eaters like me, to vegans and vegetarians. 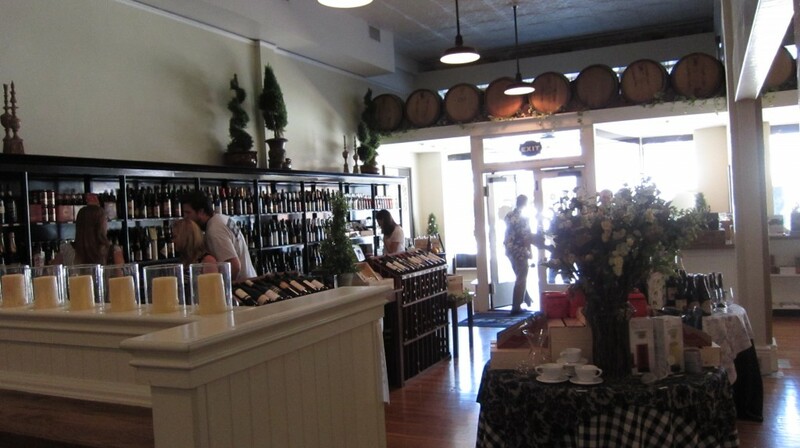 It opened it’s doors on August 1, 2011, and has been a popular spot of the neighborhood ever since. A good buddy of mine and co-worker decided to catch happy hour — beer was in order. My buddy, @joeschai had the Victory Golden Monkey, a Philadelphia brew that he is more familiar with. It was full bodied and had a great taste. It made my beer seem like water. 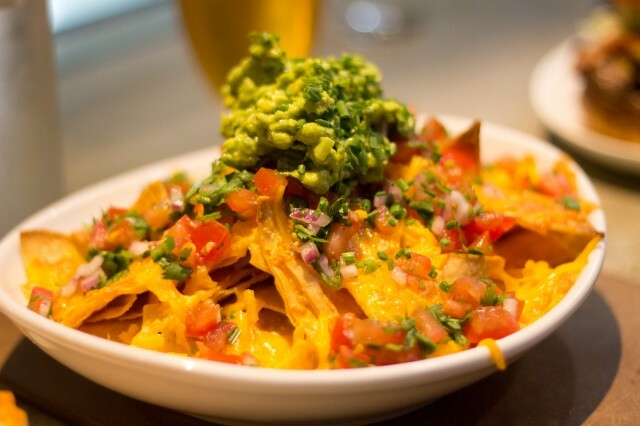 Nachoes were on the happy hour menu and it was a great start. The nachos were quite standard though, and the pico de gallo and guacamole were fresh. I’m glad it didn’t have any chili or beans in it, but the cheese could have been more gooey. I am a fan of more of a cheese sauce than just melted cheddar on my nachos. 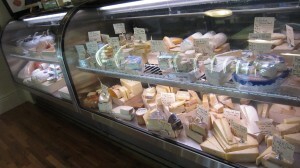 That way, the cheese won’t harden and make it nearly impossible to enjoy. Other than that though, the nachos were quite nice. The Buffalo-style Cauliflower was interesting. I felt we were ordering everything standard bar food. Beer, pizza, burger, and nachos? I wanted something to spice up our regular items and this seemed interesting enough. For a guy who hates cauliflower, this was a gamble. 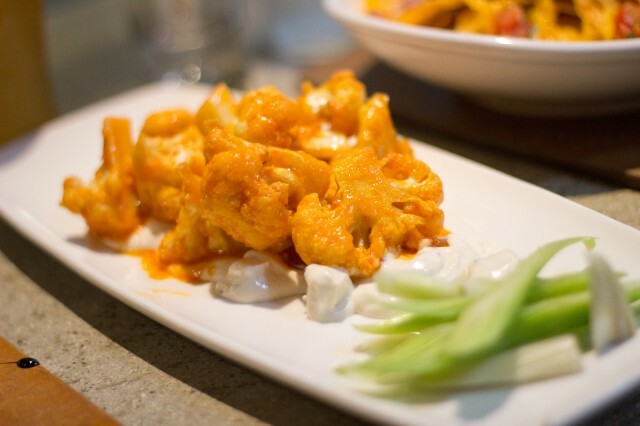 The cauliflower was a great blank vessel for the buffalo sauce. The most interesting part of this dish was the vegan “bleu cheese” dressing. Blue cheese was made of some kind of soy cheese. It tasted like plastic blocks, but the dressing itself was good. The dish was salty, zesty and full of flavor — not a bad veggie dish, fit for a vegetarian looking for some buffalo wings. I appreciate a good pizza with a balance of flavors and textures. This flatbread had an amazing balance. 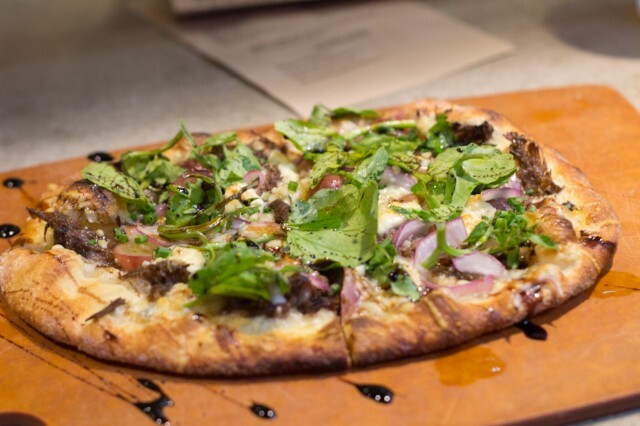 The short rib and blue cheese gave the pizza a rich flavor to it. All was countered by the red onions and greens. The kicker was the smoked grapes. This gave it a nice subtle sweetness that this pizza needed. The balsamic reduction on top finished it off perfectly. The crust was decent — not all that great actually. The toppings helped with masking the shortcomings of the dough. 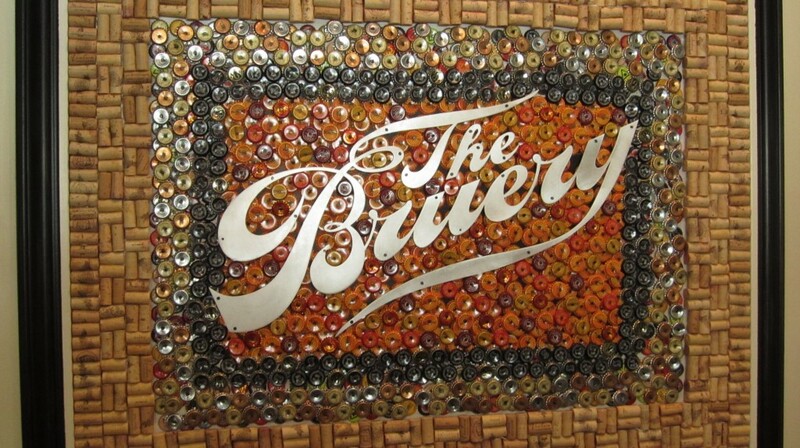 Every bar, gastropub, whatever you want to call it needs a burger. From all of their selections we opted for the one with bacon, short rib, and cheddar. The beef was nicely seared cooked to a medium. The beef was the star — the pure beef flavor from the patty and short rib shined through the burger. The bacon and everything else seemed like an afterthought. The bun was actually better than I thought. 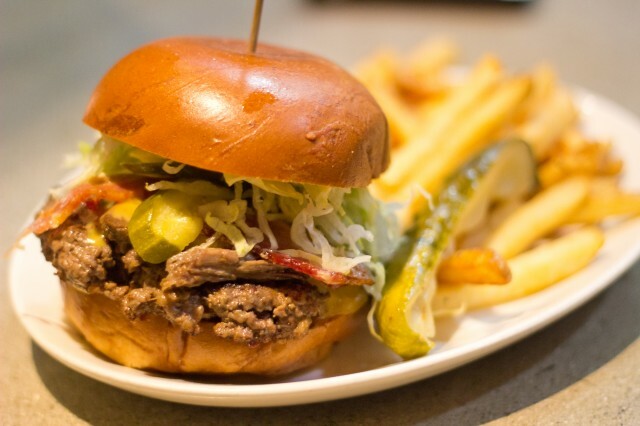 Though a burger isn’t a must order at Mohawk Bend, you wouldn’t be doing wrong by it. I hate to say this, but the concept and interior design of it all is the most impressive part of Mohawk Bend. For them to have carried out a great interior with all of the amenities in a such a rundown property is amazing. Sorry to say though, the impressive interior is not reflected onto the food as well. Nothing I ate was amazing. The only thing that really stood out was the burger, and maybe their selection of beers. Other than that, their dishes were uninspired and boring. This may be a gem in Echo Park, but in the grand scheme of the City of Los Angeles, they are just “okay.” It was still great to catch up with my friend and coworker. Good company always makes things better. It was a clear black night, a clear white moon. Warren G was on the streets, trying to consume. Some skirts for the eve, so I can get some funk. Just rollin’ in my ride, chillin’ all alone. That was some regulators action for you. I always feel like the OC can use some more gangster rap. Anyways, before you think I’m getting all randon, it really was a clear black late night, and I was trying to consume…some food. For some reason, no Del Taco run or even In-n-Out would have quenched my craving. I was feeling like a sit down — something like bar food, but better. I wanted something clean, yet greasy, and maybe a nice drink to go with it. 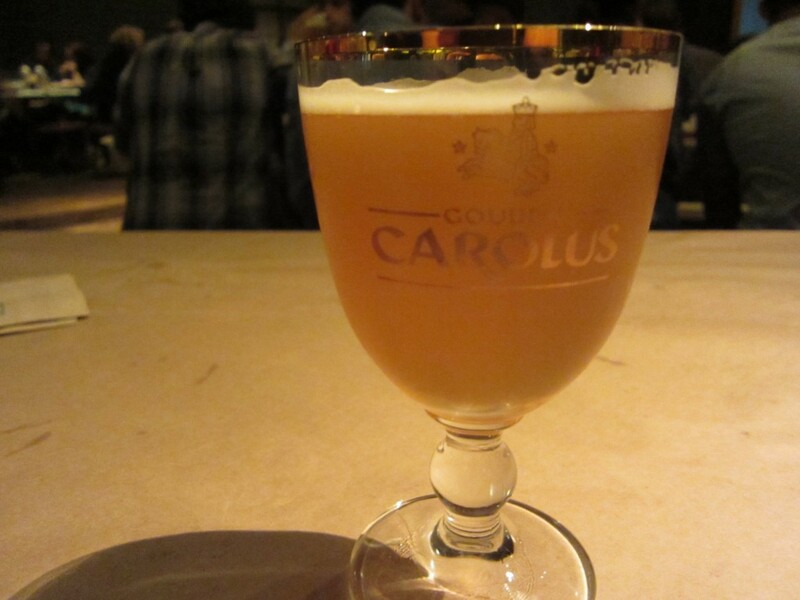 A gastropub was the perfect solution for this late night craving. Haven Gastropub in Orange, I was headed. For the drink, I probably chose the most girly “beer” there was. 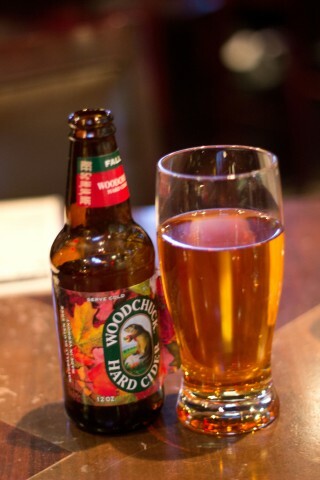 The Woodchuck hard cider was the drink of the night. It really did taste like hard cider with a hint of apples and cinamon. The alcohol was barely present, yet it was such an interesting drink. I don’t know how that decision was made, but it was late. I was tired, hungry, and excited at the same time. Alcoholic hard cider? Why not? 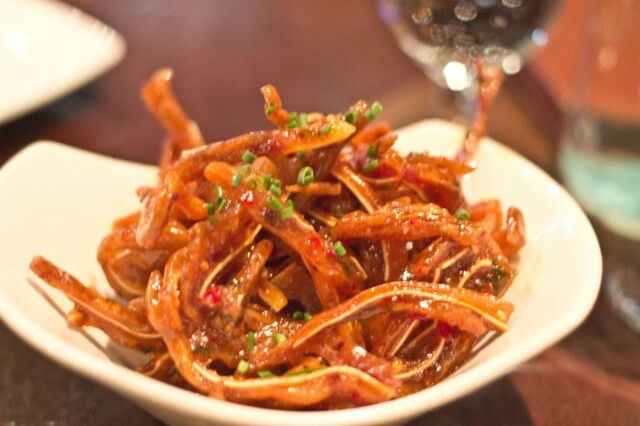 We started things off with the fried pig ears. It seems like almost all gastropubs are doing it these days. The cartilagey, disgusting pig ear was cut up thin, fried to a crisp and glazed with a tangerine and fresno chili glaze. The once soft flesh now was a sweet and crispy mound of deliciousness. It was crispy, crunchy, and chewy all at the same time. The sweetness of the glaze and the heat from the fresno chilies was a perfect balance. Though some might get turned off by the pig ears part, eatings these were a joy. Just think of it as fried pig skin, which it is, and you will be just fine. Have you ever had a salad and was like “Snap, this is freaking bomb!”? No? Me neither. Who eats salads anyways? Well, my burger came with a salad and i was bomb! Probably one of my favorite salads to date, not that I have a lot of salads to compare it to. The radicchio and frisee were bitter which was a perfect vessel to soak up all the truffle vinnagerrete. The pop of the cherry tomatoes and the chevre made a good combination. The chevre had an awesomely smooth texture that gave the salad a nice silkiness. My favorite in this salad was the twice smoked bacon lardons and the poached cage free egg on top. Who doesn’t like eggs and bacon, especially when the bacons are twice smoked lardons? 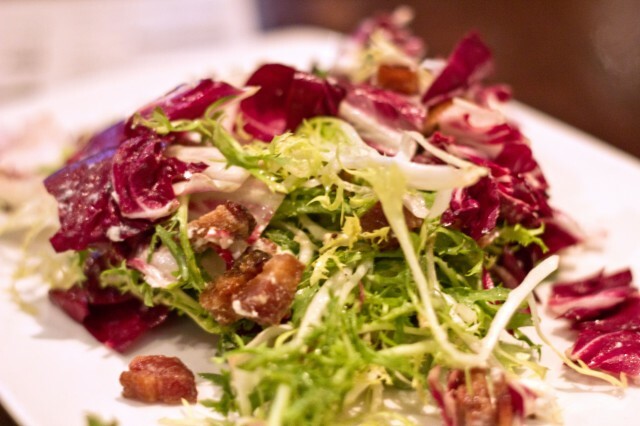 The fatty salty bacon mixed with the creaminess of the chevre and acidity of the vinnegarrete made a perfect balance in flavors. This is the best salad I had in a while. And it sure has been a while. 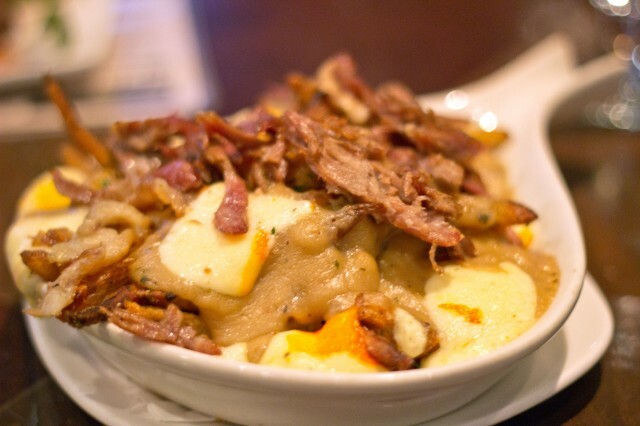 The duck confit poutine pomme frites — a lot of gastropubs are doing it, and it seems like a simple dish to make, but I never had one that was amazing. I am a guy who likes the simplicity of just thick french fries dipped in brown gravy, like the ones from The Hat. The duck gravy in this dish was nice, but it was too thick, and didn’t taste like much of anything. The duck confit was nicely cooked, but some pieces of the meat were left overcooked and dry. 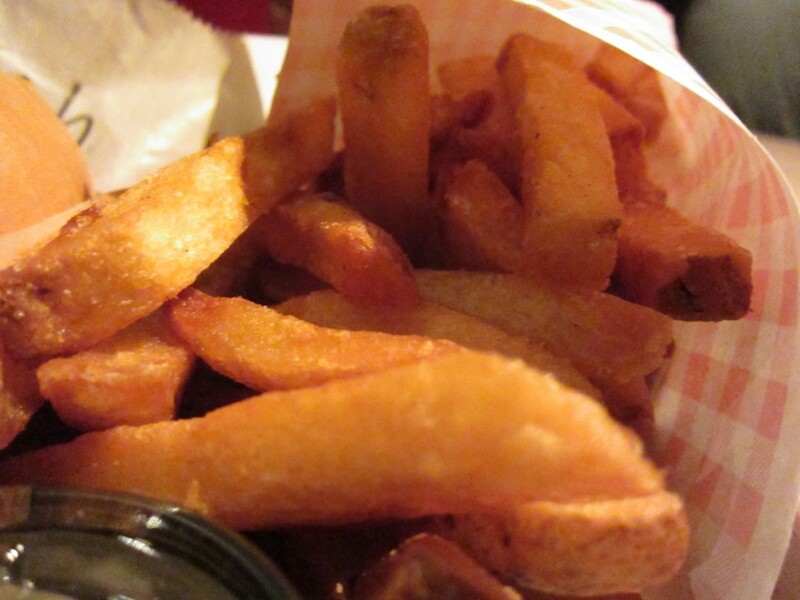 The pomme frites were nice and crunchy, and salted to a perfection. I thnk if the gravy was more savory, it would have been a home run. I love a good mac and cheese. The gooey factor alone can leave me feenin’ for this stuff after a bad day. I sure was happy to have ordered the mac and cheese here. 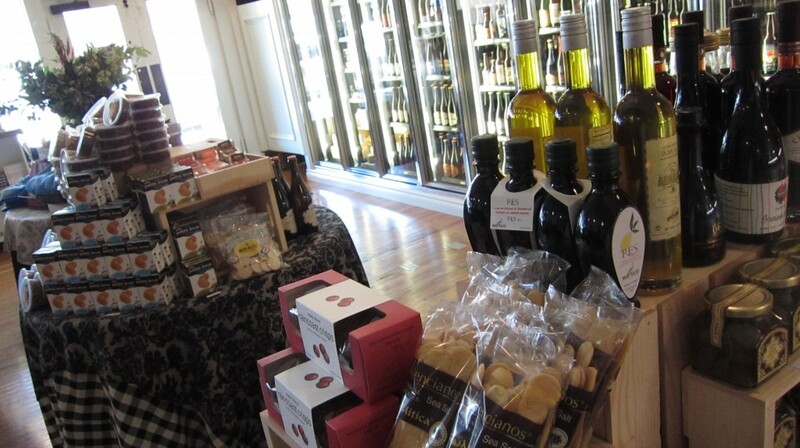 The black truffles alone were a nice touch. It gave such a depth of flavor unattainable without it. 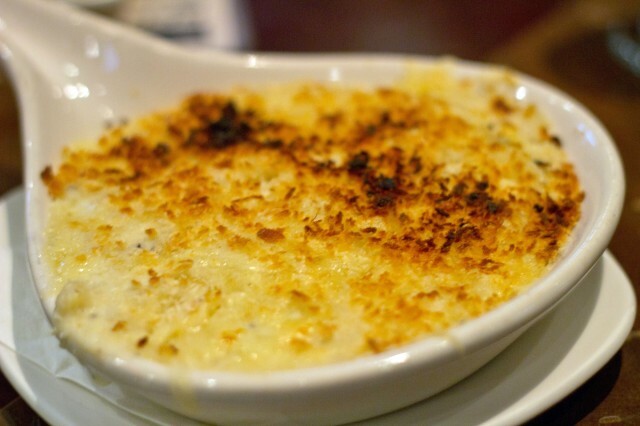 A perfect mix of gruyere, fontina, and parmesan, interlaced between each noodle had perfect consistency and flavor. The crust of panko on top wasn’t my favorite, but nothing with panko really is. This dish of mac and cheese was good, but I felt like something was missing. I couldn’t quite put my finger on it, but I felt it needed some kind of spiciness or textural difference. At the end of the day, it was a pretty standard bowl, saved by the little truffles that it did have. 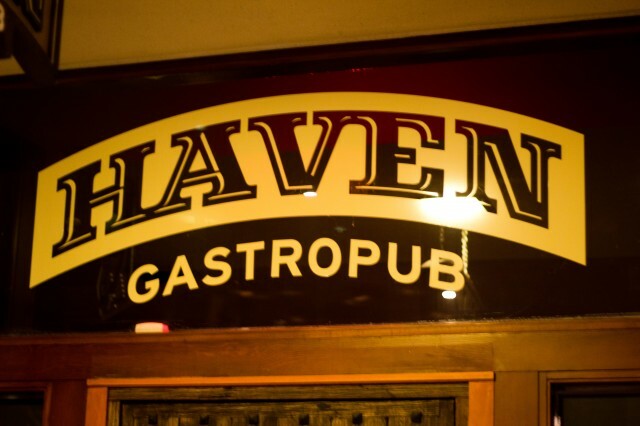 My time at Haven Gastropub was awesome. The atmosphere was relaxing and fun, and having a drink, eating good food was just what I needed. 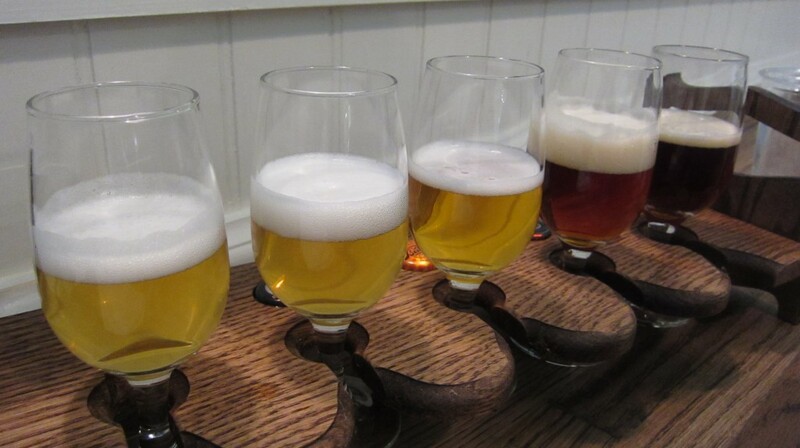 Things that stood out the most was their selection in craft beers. I’m no beer officionato, but their beer list was unique and diverse — any beer lover would enjoy it here. 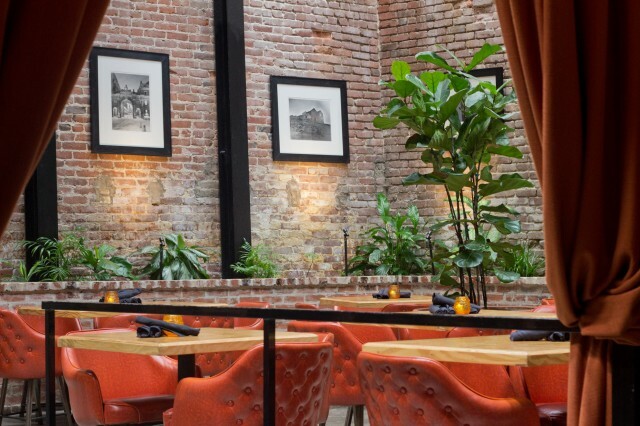 Opening in 2009, Haven in Orange received some great accolades — OC Weekly named it the best new restaurant in 2009. Still a pup, the restaurant expanded to Pasadena as well. 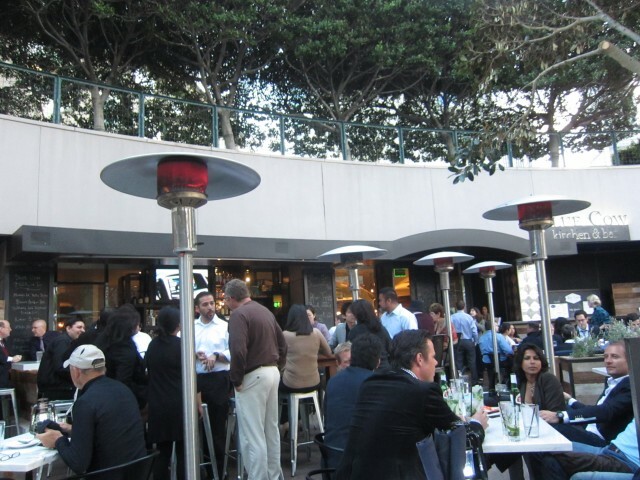 Whether you are in the OC or in LA, chillin’ with a beer and good food is covered. After glowing reviews about a new, hip sandwich spot in Downtown, I immediately put Blue Cow Kitchen in The List. 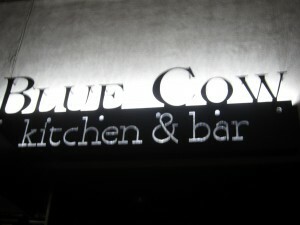 Having eaten at Casa, the restaurant the preceded Blue Cow, I was a bit skeptical. 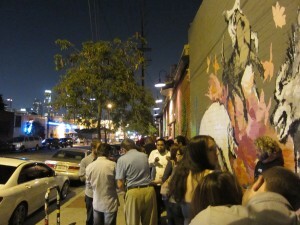 I wasn’t too fond of my last visit to Casa, and finding out that it went out of business didn’t surprise me. 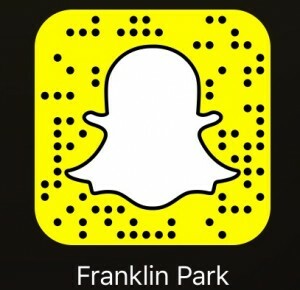 It was exciting to find that Mendocino farms is venturing out and starting a sandwich spot / bar. Ultimately, I was hungry and wanted to see what all of the fuss was about. 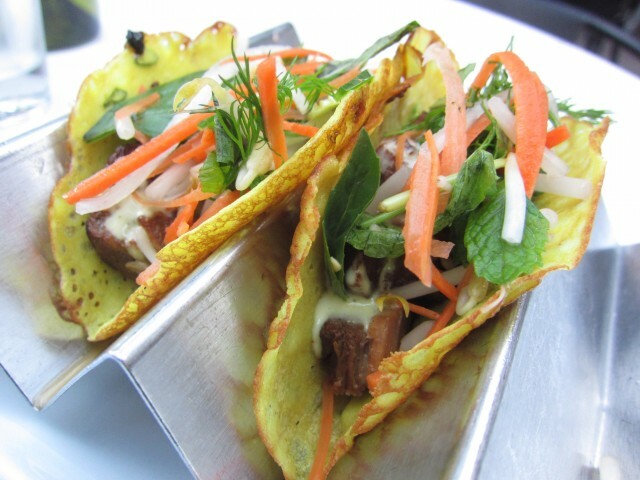 When I read that a New-American happy hour joint was serving pork belly bahn “mini” sandwiches, I was surprised. The bahn xeo taco shells were made of some kind of crepe batter. The filling of pickled vegetables, herbs and sweet aioli were familiarized by my taste buds, but the taco look alike made this fun to eat. The pork belly was fatty, though not too fatty, and the meat was tasty. This was a perfect little package. 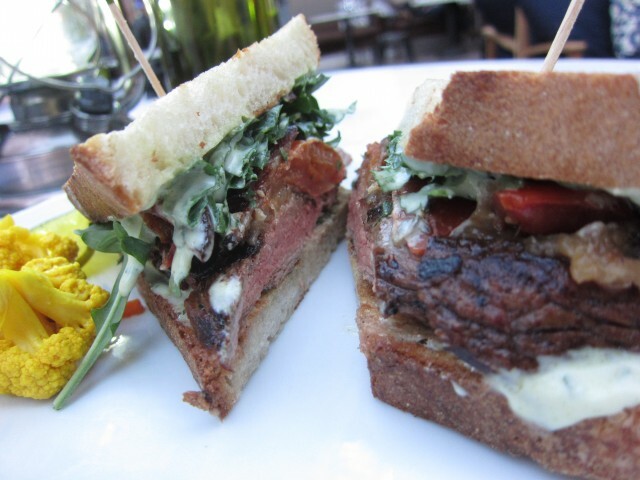 The Blue Cow Mendo steak sandwich was better than I thought it would be. Grilled to a perfect medium, the steak wasn’t tough at all. I always don’t like steak sandwiches that don’t bite off with your teeth. 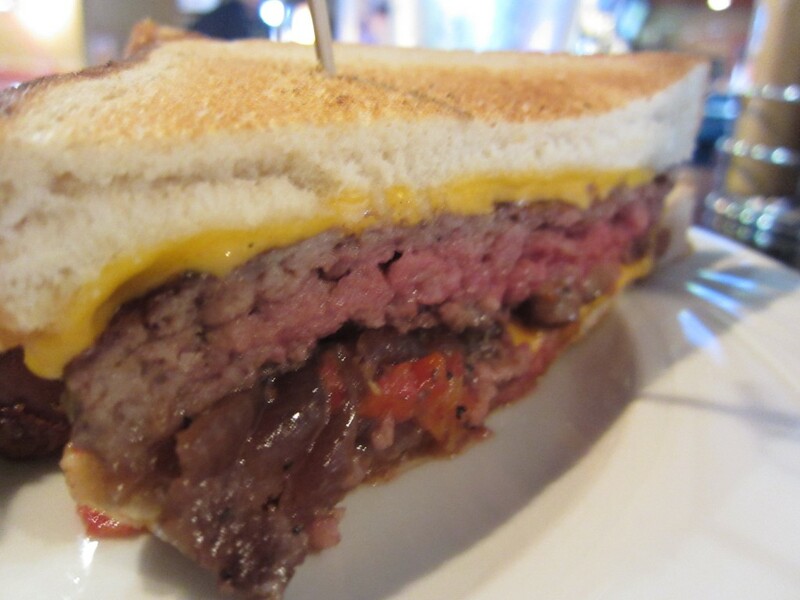 You are left pulling the steak from your teeth like a barbarian –this sandwich wasn’t so. The meat was tender and flavorful from the marinade and super thick. Topped with roasted tomato, and caramelized onions, it gave it enough complexity. The candied bacon was lacking, but the arugula and cilantro spread rounded out everything well. Grilled rustic white bread was a perfect choice for this rustic sandwich. Pickles, picked carrots, and cauliflower in between bites made this a perfect steak sandwich. My carnivorous side kicked in, and I wanted more meat. We ordered the Pitman Farm’s duck wings. Intrigued at first, I was a bit disappointed in these. 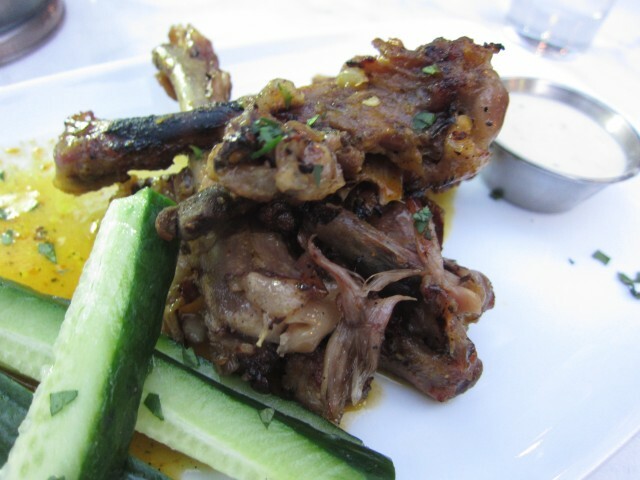 The duck wings confit are grilled with an aji amarillo glaze. The glaze was tasty, and the dipping sauce was a nice accompaniment. My only gripe about this dish was that it came out looking half eaten. Maybe it was because it was so “off the bone” tender, but all of the meat was literally off the bone. I honestly was looking for something like regular chicken wings, but from a duck. Nonetheless, the meat was buttery smooth and delicious. The name got me — pink eggs and ham. These eggs marinated in beet juice, outer egg whites turned pink. Using Mendocino mustard for the filling, the taste was exceptional. These were up there with some of the best deviled eggs I ever had. 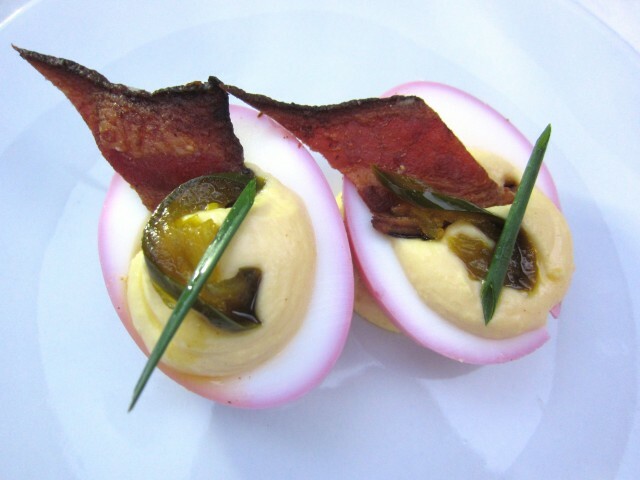 Topped with double smoked bacon and candied jalapenos, it was a delight, rich with flavor. I’m glad the name caught me because I would have missed out have I not ordered these. After an interesting “small plates” kind of dinner, there was something called Ooey Gooey Cake. It isn’t on the menu, but something called Ooey Gooey cake has to be good. It was almost like a tres leches cake, without the wetness. 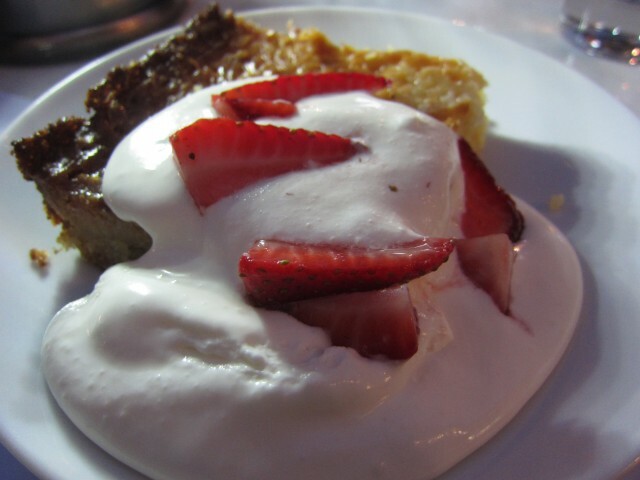 The creme fraiche and strawberries were a nice addition to the cake. The cake itself was dense, yet fluffy, and not too sweet. It was a great ending. I was surprised with their dishes. The small plates made it easy to try a lot of different things. The atmosphere is nice inside and outside. I felt like I didn’t fit in. Everyone was in suits and business attire, and there I was with jeans, and a t-shirt. It didn’t matter because the vibe of the whole place wasn’t stuffy at all. Even at the end, the waitor gave us the check and a little sketch book to draw in. I flipped through and saw a bunch of doodles and writings everyone did. 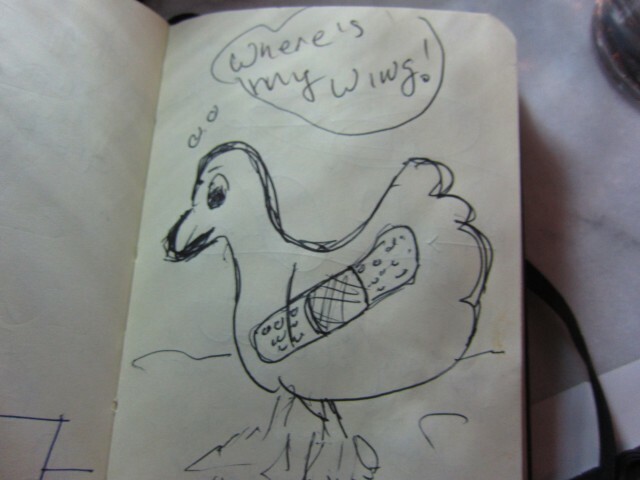 One in particular caught my eye — it was a duck without its wing because, well, we had duck wings confit. I thought little things like that made this place so relaxed and was a fun dining experience. This new sandwich and happy hour hot spot gets crowded after 5 PM. I came for the food, but most come to drink. Either way, you come, sit, and “Eat Happy”. Hungry before going out to Disneyland, we needed a bite to eat. Knowing of course that Disneyland had not a single decent place to get a good meal, we decided to eat outside, but near by. 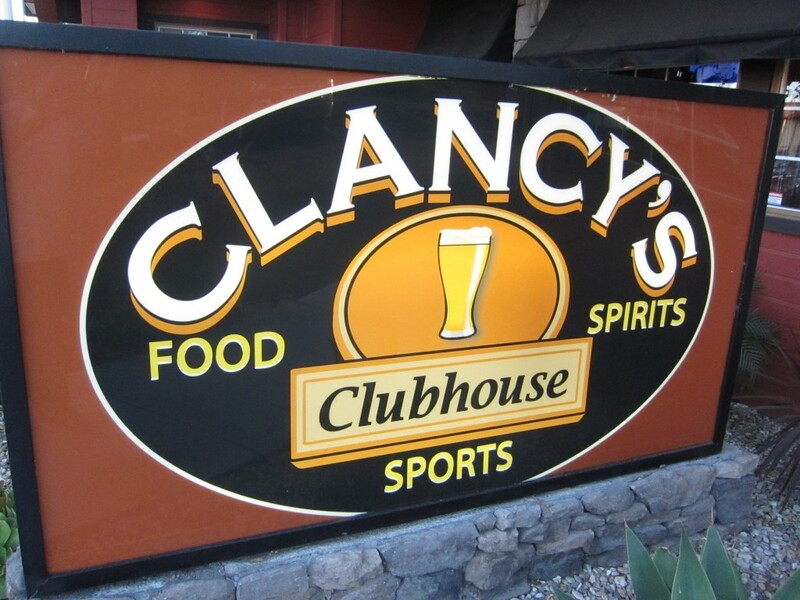 Clancy’c Clubhouse was just around the corner, and it was one of those places I always pass by, and say “I wonder if it’s good there.” This time, we finally tried it. I was excited to see that it was a sports bar. It was relaxed and inviting. At first, I thought it was more like a steak house type restaurant, but was glad that it was casual. They had a bar area, TVs everywhere and tables games scattered everywhere. The inside was fun, and this would be a perfect place to watch sports games or hold a nice event. I ordered the Clubhouse burger. It had applewood smoked bacon, bleu cheese, grilled onions and chipotle aioli. This had so much flavor — almost too much flavor. 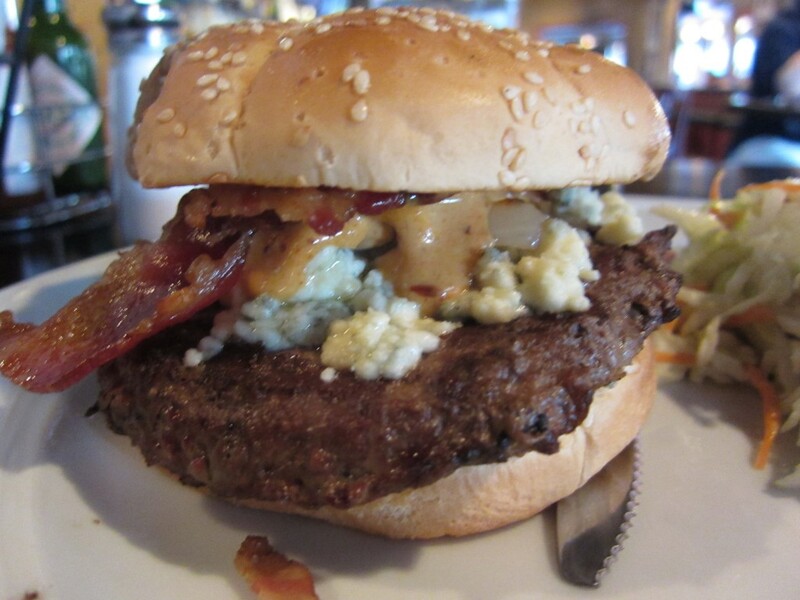 The bleu cheese already was strong in taste and packs a lot of flavor. The bacon was salty and the chipotle aioli was another flavor element that was strong. Though it had a potent flavor profile, and a bit on the salty side, I liked it. The flavor was intense and I am a sucker for bleu cheese. My burger was especially good with the side of house made potato chips we ordered. It came in a big deep bowl and it almost seemed endless. The chips were especially good dipping it in their green onion dip. Some chips were kind of soggy, but the chips were light and crispy, not crunchy. Their Grilled Cheese burger was more mild in flavor, but good as well. It was basically a grileld cheese sandwich, with a beef patty. The oven dried tomato aioli, american cheese, caramelized onions were a perfect mix in the sandwich burger. All in all, I was impressed with this establishment. The food was good and the atmosphere was fun. 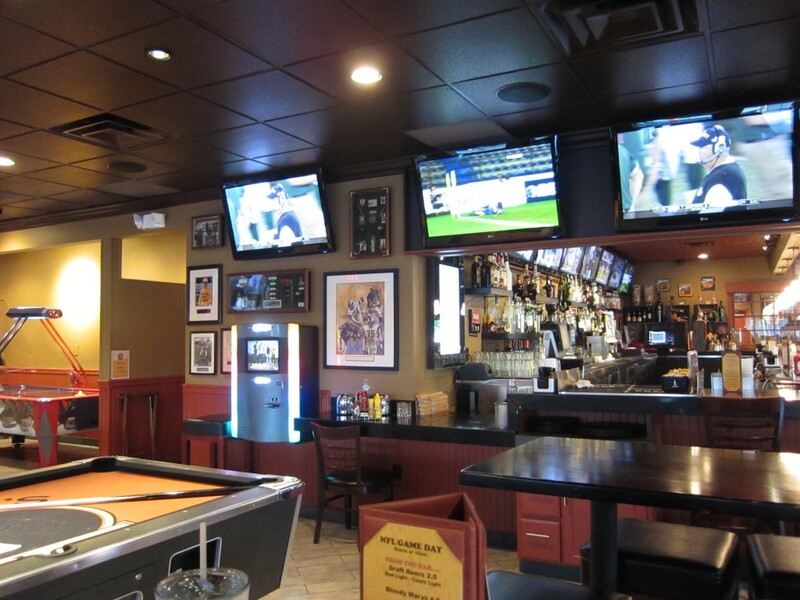 I might consider watching some sports games here. Now we just have to hope that the NBA handles this lock out. 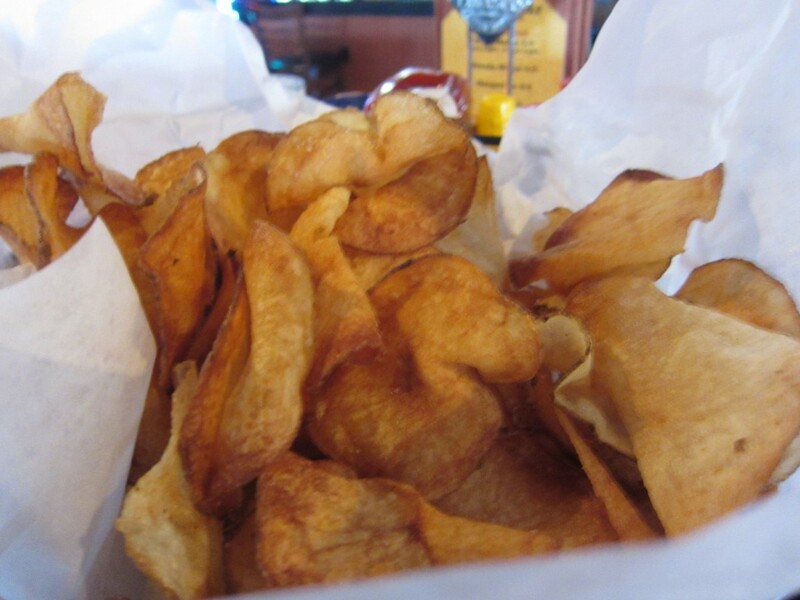 I need my basketball with my home made potato chips. On my way to Neptune’s Net, I couldn’t help but notice how expansive Malibu is. I was driving almost 30 minutes north on the PCH, and I was still in Malibu? Crazy right? So why would anyone want to drive so far for some seafood? Well, it’s “The Net” — people from all walks of life come here just to be a part of it. It’s far enough to feel like you went away, but close enough because it’s still Malibu. Upon arriving, it was just like I imagined it. 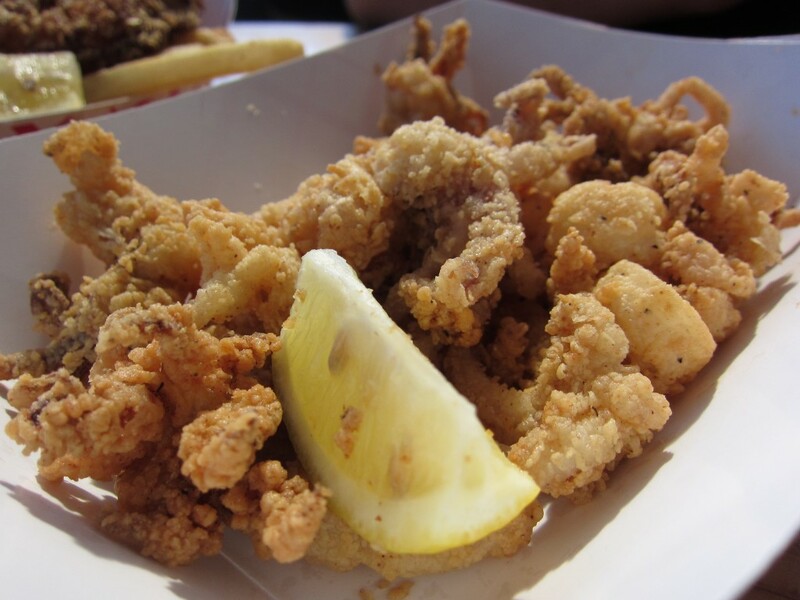 Hoards of people in line, motorcycles parked in the front, and the smell of fried seafood. People from all walks of life were there –families with children, couples, bikers, and all were sitting together, enjoying some delicious seafood. 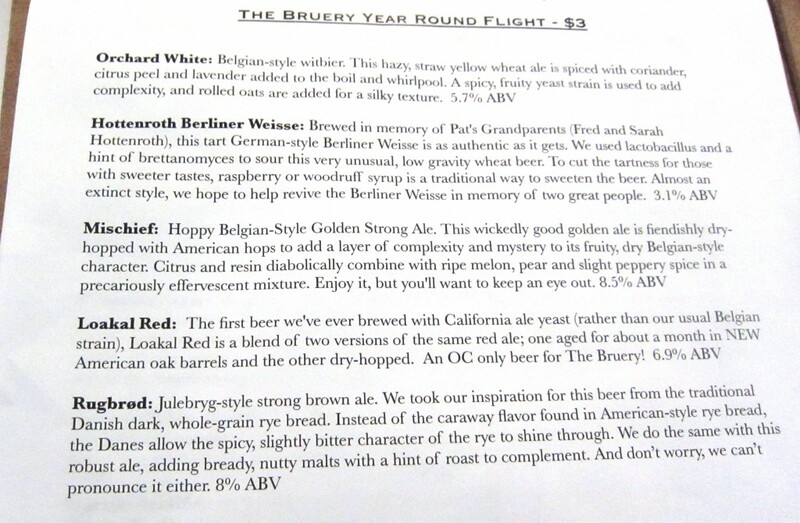 The beer selection they have is amazing. Half of the stuff were beers I had never heard of before. All in all, it was a great and new experience for me. We ordered the fried fish and shrimp combo plate, and the calimari plate. Honestly, the shrimp and calimari were amazing, and the fish was even more so. It was the best fried fish I have ever had. I was surprised. 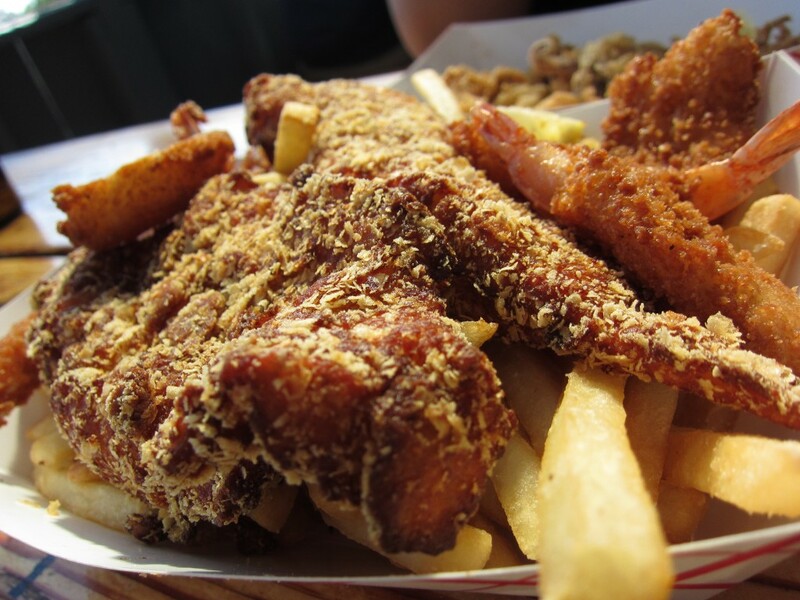 Most of the time, the fried fish I get is always either too greasy or tasteless. The fried fish at Neptune’s Net was so crispy and had so much flavor. I would order that all the time. I was sad to find out that they did not have the lobster rolls anymore. I was in the mood for some lobster and couldn’t have my lobster roll fix. On the other side of the restaurant is their fresh seafood section. There you can get whole lobsters and crabs and oysters. I wanted to get some fresh raw oysters, but the line for that side was much too long, and my fried goods were getting cold every second I stood there, so I bailed. 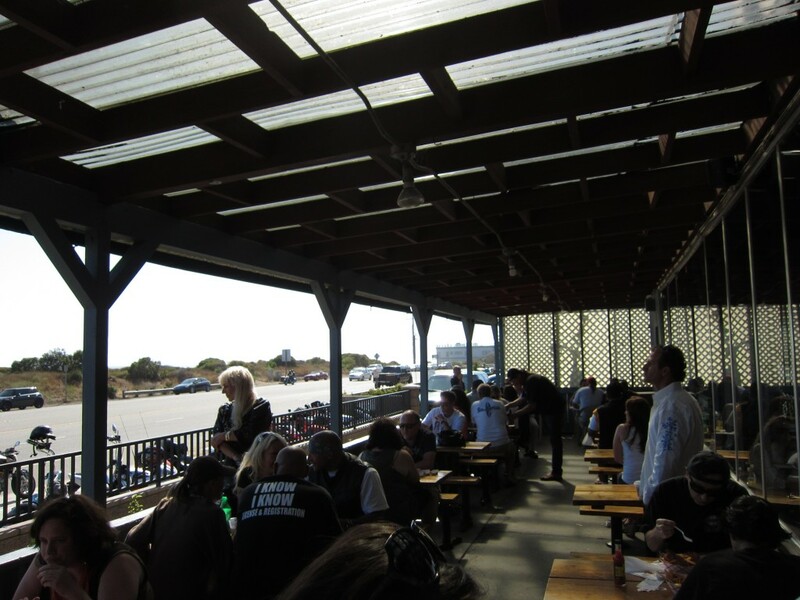 Finding a seat is kind of difficult, but a group of bikers were friendly enough to share their table with us. They formed a wall of beer bottles between us — we all need borders right? All in all, I am glad we made the trip up here. The scene is great, and eating fresh seafood near the ocean is always fun. This place always reminds me of the The Fast and the Furious. 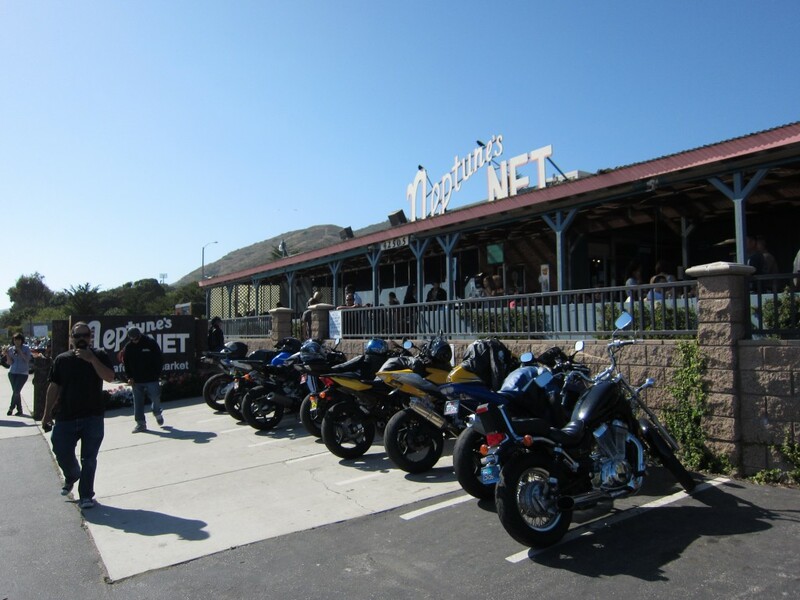 Vin Diesels character and Brian O Connor race down PCH against a black Ferarri, and after beating it, they enjoy some food at Neptune’s Net. Except, in the movie, nobody was there except those two. Don’t ask me why I know that movie so well. Let’s just say I wrote a paper on the movie back in college. 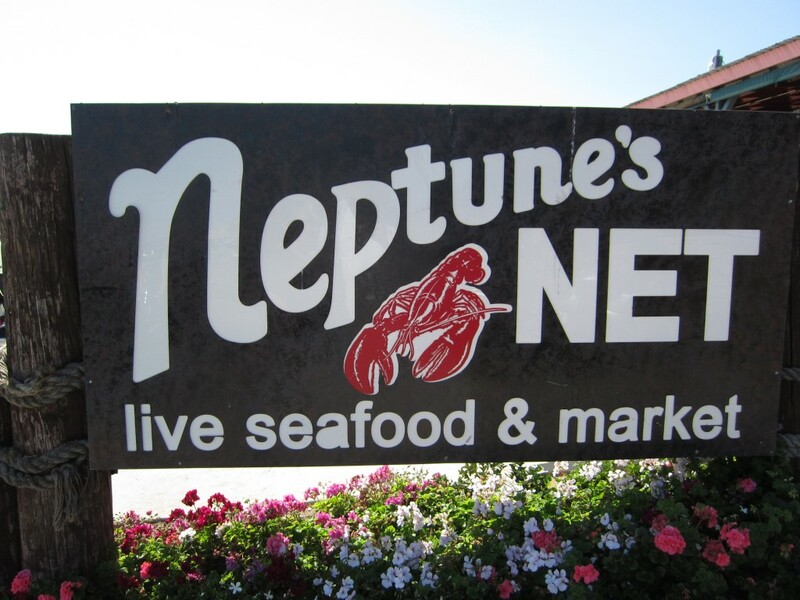 Anyways, before I go off topic any further, Neptune’s Net is a cool place to have lunch or dinner. Imagine driving down with your bike crew or friends before sunset, eating fresh seafood and drinking some beers. That is what Neptune’s Net is all about. Cheers. 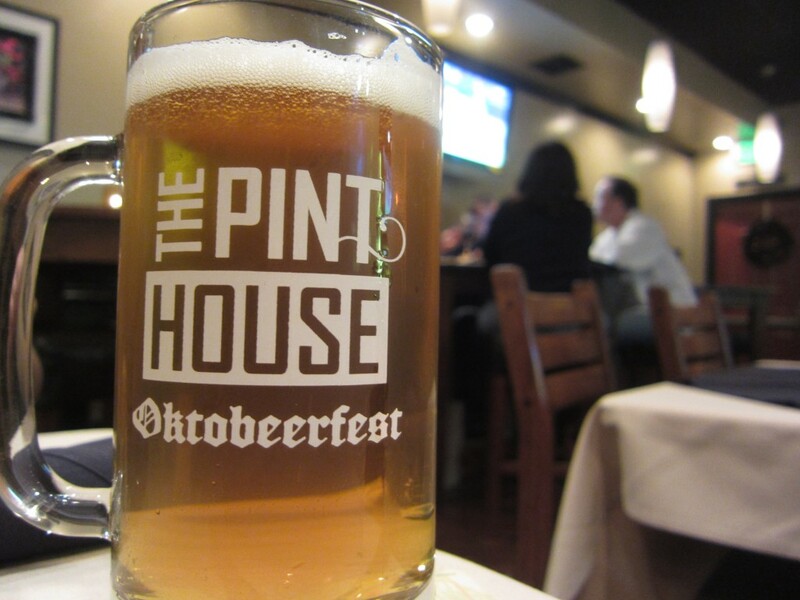 I was in Downtown Fullerton, and I came across The Pint House. From the back, where the parking is, there were lights outside streaming across the dining area. There was a smokey smell coming from this place and it looked nice. We wanted to give it a try. 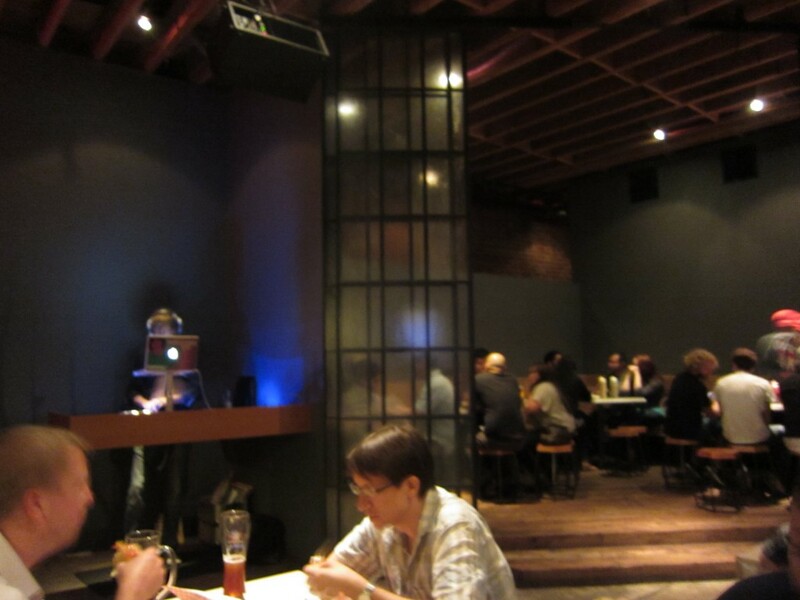 The inside was like an upscale pub with a bar and nice seating area. I was surprised to see all of the prices so low. The interior was really nice. 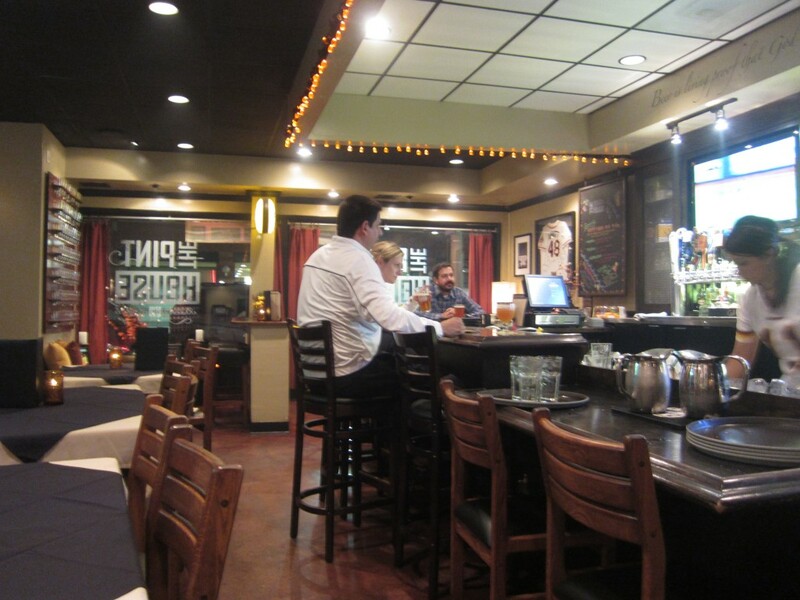 You can get the nice quiet and quaint inside or the live music filled air, a little rowdy outside. Check the bottom for the video of the live band playing fun German style music. Lucky for us, Oktobeerfest was going on. Every Sunday in October, from 4 to 8, they had a special going on for food. $6 got you parmasan fries and a bratwurst, and all appetizers were 25% off. Awesome if you ask me. 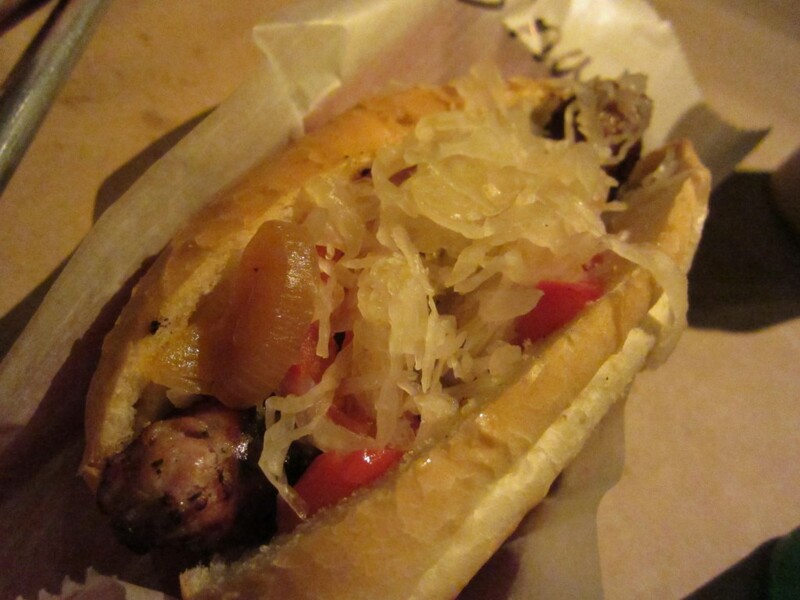 The bratwurst was really tasty. It was juicy on the inside and it had a nice snap. 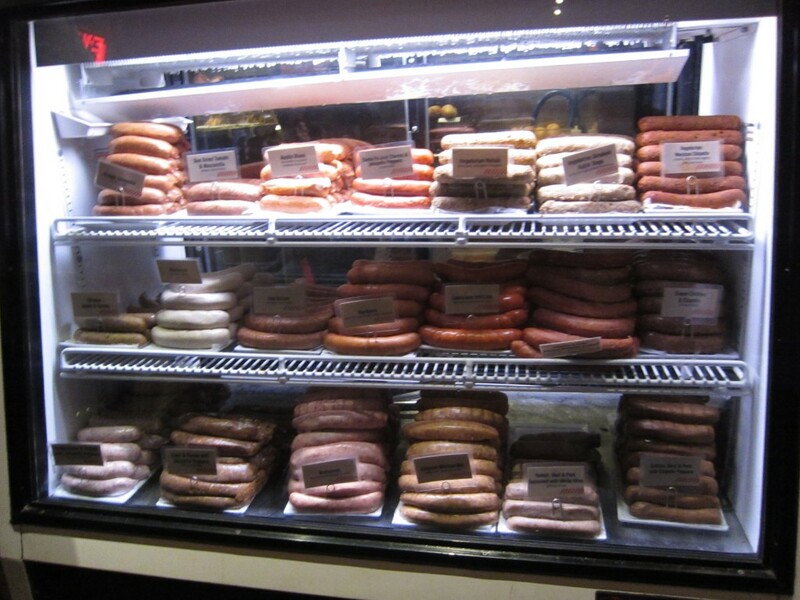 I did not like the bread they used — too much bread for the amount of sausage. Also, the bread was a bit chewy. I kind of liked the chewiness, though others might not like it. The parmasan fries were tasty as well. It was nicely seasoned and the cheese was a great addition. For 6 bucks, you would expect just regular fries, but the fact that they give you parmasan fries was a plus. 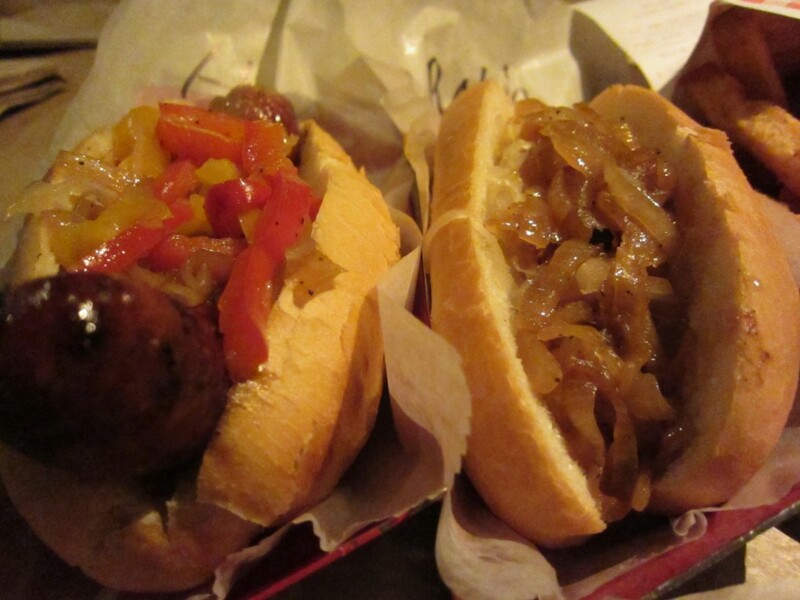 What is better with bratwurst than some beer. We ordered a beer in the take home pint class mug. They surprised us with any kind of beer, but we had an inkling it was Blue Moon. We got to take home the mug as a souvenir. 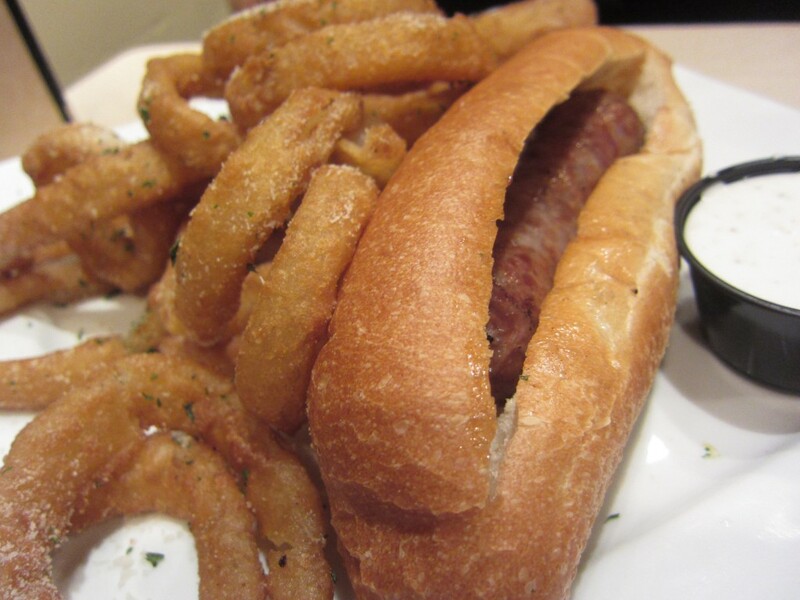 You can also substitute the parasan fries for onion rings. Their onion rings were surprisingly tasty. The batter was light, and the flavor was definitely there. Dipping it in the ranch dressing was great. I was expecting maybe 6 to 8 pieces, but the plate was filled with onion rings. This too was only 6 bucks. Amazing. We were a bit hungry so we ordered the cheese quesadilla. This was only 5 bucks, plus 25% off. That is less that 5 bucks, if my math is correct. The quesadilla was supposedly grilled, but that was not the good part. Their fire roasted salsa was amazing. It made this normal quesadilla taste so much better. 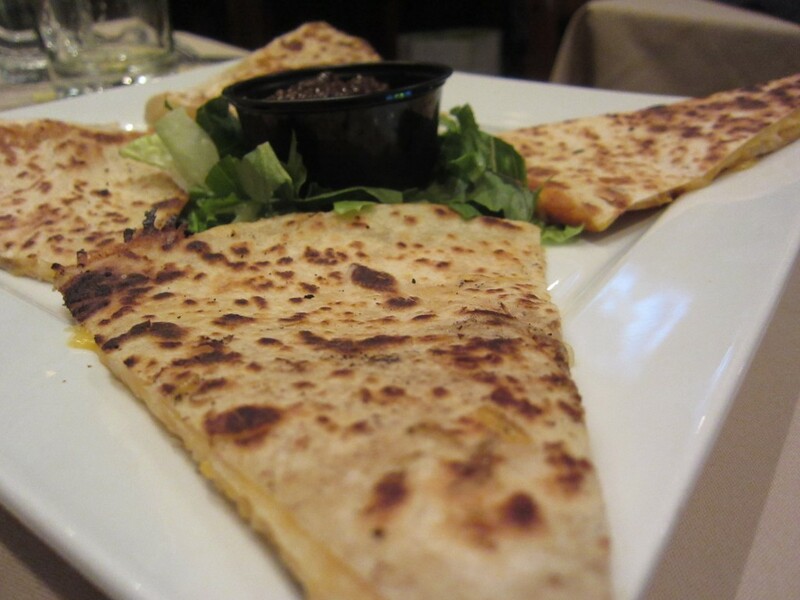 A quesadilla is a quesadilla — melted cheese between tortillas. The fire roasted salsa had a deep dark color from the char, and it was amazingly delicious. If not, I would come again just for that salsa. I was surprised at this place. 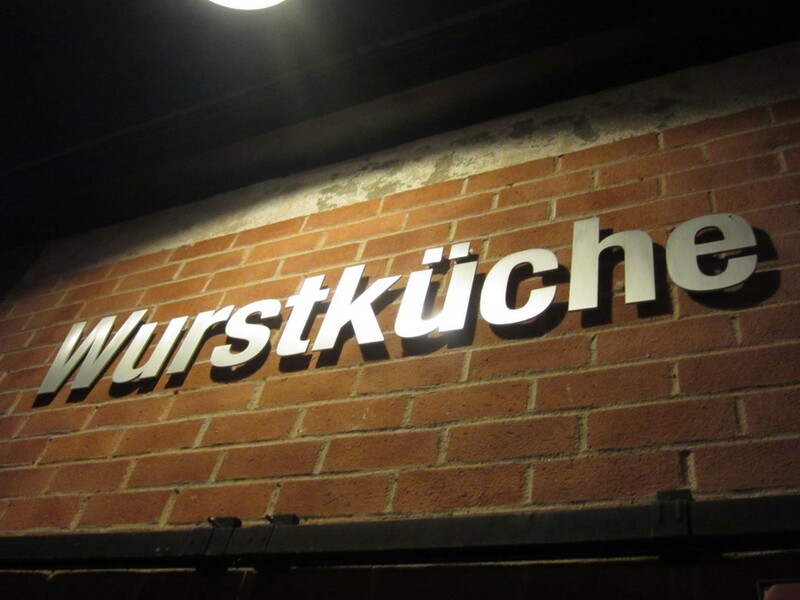 The menu was was impressive and the prices for the Sunday Oktobeerfest was even more appealing. What was cool to me was the live band playing Planning where to eat isn’t the best. You sometimes stumble upon something new and something great. 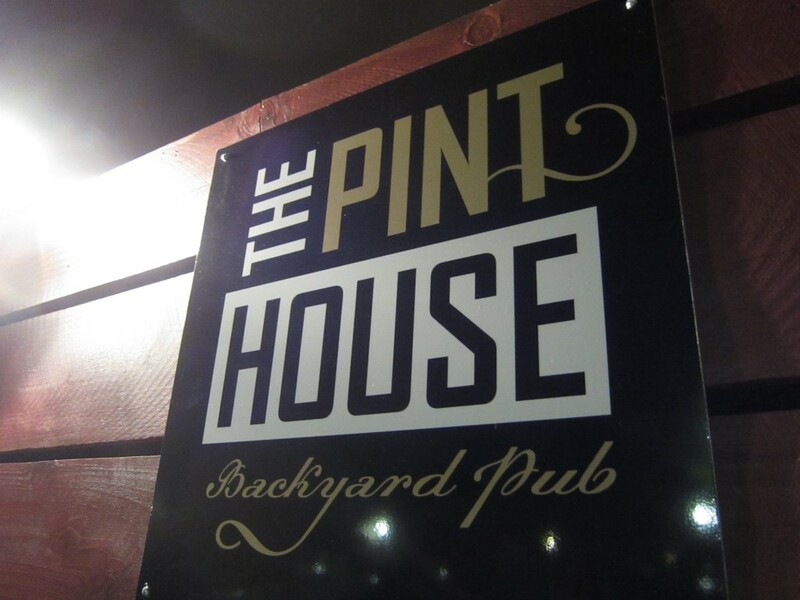 I tried The Pint House, and I was happy to find their menu to be tasty and cheap. The food was delicious and the salsa was memorable. 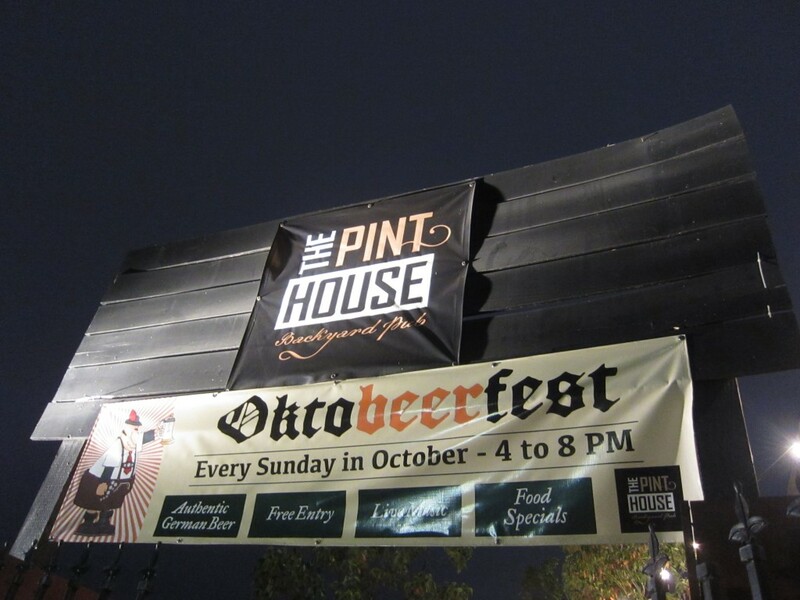 Los Angeles Beer Fest 2011 – It is on! The LA Beer Fest is here! On Saturday, April 9, 2011 Sony Studios will host the event. There will be food, music, and of course, BEER! 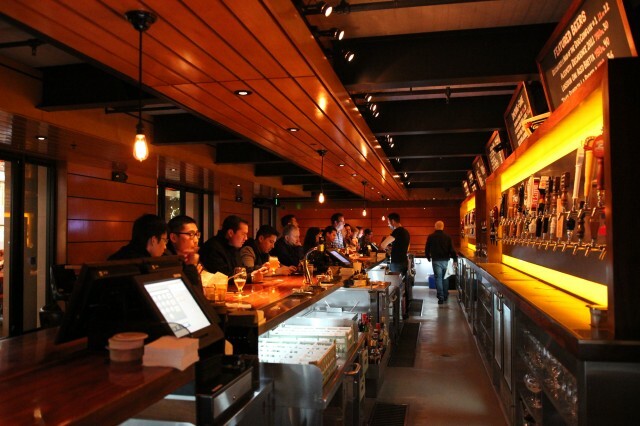 Look out for international and domestic beers as well as LA’s gourmet food trucks. It will be from 12PM – 3PM and 5PM to 8PM. As for that 2 hour break in between? No clue. The admission price is $40 and that includes unlimited beer! So drink up! Be safe and have fun.